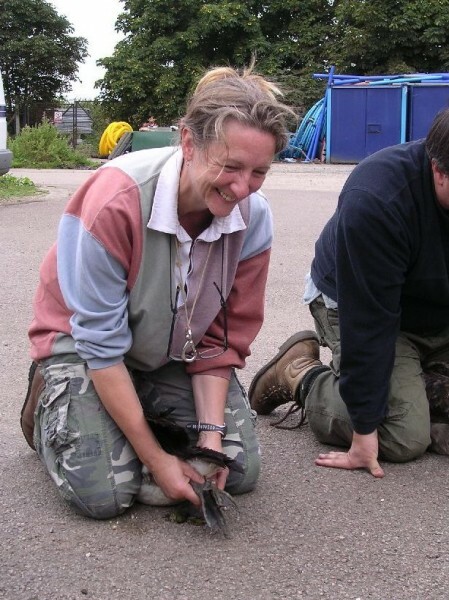 This is just an ordinary blog for random thoughts and diary entries about our three big passions in life – birding, bird ringing (bird banding) and anything to do with the natural world. Why is it called Wild Place? Purely after our love of wild and wilderness places, the natural world and our desire to be out there whenever possible! I’ve been interested in natural history, biology, ecology and conservation all my life. I started bird ringing in 2004 in the Outer Hebrides and it has taken over my whole life and changed it beyond all recognition! In December 2008 i progressed to my A permit. I have ringed in England, Scotland, Wales, Canada (where i was the bander in charge for Innis Point Bird Observatory in 2008 and at Delta Marsh Bird Observatory during 2009), Sweden, Gibraltar and Cape Verde. A little history: I started off this blog in 2008 as a way of keeping in touch with my friends and family while travelling and ringing abroad. I haven’t been very active during the last twelve months for various reasons but now want to continue where i left off. As Ian and i got married last year i thought it would be a good idea for it to become a joint blog – he hasn’t been much into blogging but when he travelled before we met in 2006 he used to keep a diary which he would email to his friends and family – i will try to persuade him to publish some extracts on here, they are VERY amusing. Having worked in the telecoms industry for 30 years, I found myself in the very fortunate position of being offered early voluntary redundancy at the age of 49, which I accepted in 2000 and launched myself into the realms of consultancy. One year later after having worked in Athens, Gothenburg and Vienna, I decided that I could survive without “paid employment” and thereafter followed my passion, birds and the natural world. Being a bird ringer, I soon found that this was a skill in great demand around the world. I spent the next 10 years travelling, being abroad for up to 10 months a year, volunteering or running bird observatories. This took me to 5 continents depending how your geography teacher viewed the world, which included Europe (Gibraltar, Spain, Sweden), North America (Manitoba, Ontario), Africa (Namibia, South Africa, Cape Verde, Morocco), Central America (Costa Rica, Mexico) and Asia (Kazakhstan). As many of these observatories are situated in multi purpose field stations, I found myself amongst experts in other fields of natural history, none more so that the those studying the turtles of Tortuguero, Costa Rica and the entomologists and botanists from Gibraltar and Morocco. In 2006, I had the good fortune to meet Yvonne in Gibraltar, after which we continued our travels – together. It was always my plan to settle down after 10 years of travel as the BIG 60 does not always look good on a CV when recruiting personnel to work at altitude or bug infested habitats, which many of these places are. Having seen many parts of the world through work and travel, we both decided to settle here in South Uist, which says a great deal about the place. The intention was to become sedentary and concentrate on our own projects here with birds and moths at the forefront, and I could indulge myself once again in my other passion, fly fishing. With me having hardly picked up a rod and plans in the pipeline for Churchill, Manitoba, Texas and Gibraltar, we will have to see how that plays out.